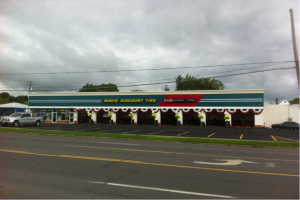 Rochester, NY – Giunta, Kaman & Farrington of Pyramid’s Rochester office sold a multi-tenant retail/office building in Geneva, NY that was redeveloped for Mavis Discount Tire. 368 Hamilton Street in Geneva, NY has been redeveloped for Mavis Discount Tire. The former retail/office building included tenants such as a gas station, convenience store, car wash, pizza shop, office and used car sales. This property is conveniently located in Geneva’s primary retail corridor less than one mile from Hobart & William Smith Colleges. Christopher D. Giunta, John B. Kaman and David K. Farrington represented the seller in this transaction.